Dr. Charles Kattuah graduated from the University of the Pacific Arthur A. Dugoni School of Dentistry in 1998 and was elected in the Tau Kappa Omega Dental Honor Society. He completed post-graduate training through the University of the Pacific’s Advanced Clinical Experience (ACE) residency in Union City, CA in 1999. 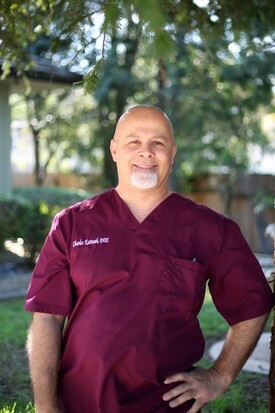 Dr. Kattuah is a member of the American Dental Association and California Dental Association, and also serves on the board of the Butte-Sierra District Dental Society. Dr. Kattuah has traveled to Ensenada, Mexico to volunteer with Nor-Cal clinic, an association of Rotary International, to treat people who do not have access to dental care. In his spare time, Dr. Kattuah enjoys snowboarding, wakeboarding, golf, motorcycle riding, and swimming.